Jakarta 05/03/2015. Financial institutions investing in Indonesia’s high-growth sectors have an opportunity to align their investments with the corporate pledges to zero deforestation as a way to manage their risk exposure. The Earth Security Group (ESG) convened a financial innovation workshop in Jakarta on March 5th hosted by one of Indonesia’s largest banks, Bank Negara Indonesia (BNI), in partnership with the Indonesia Business Council for Sustainable Development (IBCSD) and the Indonesian Chamber of Commerce and Industry (Kadin). The workshop, led by ESG’s Chief Executive Alejandro Litovsky, brought together banks, insurers, investors, large Indonesian palm oil companies and government representatives to discuss ESG’s Innovation Brief on Indonesian Palm Oil, which was presented by Margot Hill Clarvis, Senior Manager of Earth Security Group. The workshop convened 50 key industry players including Bank Negara Indonesia (BNI), Wilmar, Cargill, Sinar Mas, the Indonesian Palm Oil Association (GAPKI), the Oil Palm Smallholder Union ‘Serikat Petani Kelapa Sawit’ (SPKS), the General Insurance Association of Indonesia, Maipark Reinsurance, Willis Group, Supervisory Board Bank Indonesia, First State Investments Indonesia, HSBC Indonesia, IFC, World Bank, and the Ministry of Planning. A new weather insurance product that promotes zero deforestation: Indonesia’s insurance sector will grow by double digits in the next few years from currently some of the lowest rates in the world. Agriculture insurance that offer risk premium discounts to sustainable palm oil companies can contribute to create a step-change in how resilience is valued in the market. The workshop brought together Willis Group, one of the largest global insurance brokers, with the General Insurance Association of Indonesia, for a first discussion of this opportunity, with outcomes being followed up. Biodiesel energy investments in sustainable palm oil: As the government increases biodiesel targets, energy investors will be increasingly exposed to land conflicts and land use related carbon emissions associated with palm oil. Regulatory risks given the industry’s reliance on production subsidies and government buyers (Pertamina and PLN) were also identified in the session. Investors must monitor closely the emerging biofuels scheme being developed by the Indonesian Sustainable Palm Oil system for strategic direction. SME credit to help smallholders avoid forest fires: While smallholders account for a 40% share of palm oil production in Indonesia, insecure land tenure is both a driver of land conflict and a barrier to obtain formal credit. 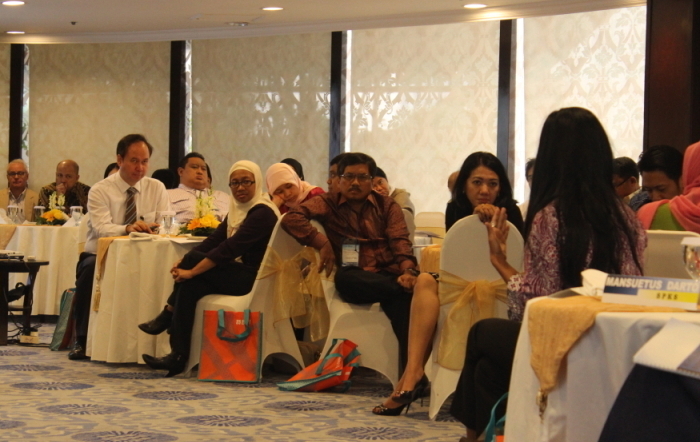 The innovation workshop featured Serikat Petani Kelapa Sawit (SPKS), one of Indonesia’s largest smallholder unions. SPKS’ director announced a sustainability pledge from smallholders at the meeting and discussed with large banks the innovations outlined in the brief to overcome barriers to credit. As a result of the workshop the smallholders’ union initiated a collaboration with IBCSD and Kadin to improve the cooperation of independent smallholders with large companies. The outcomes will be followed up in the coming weeks. 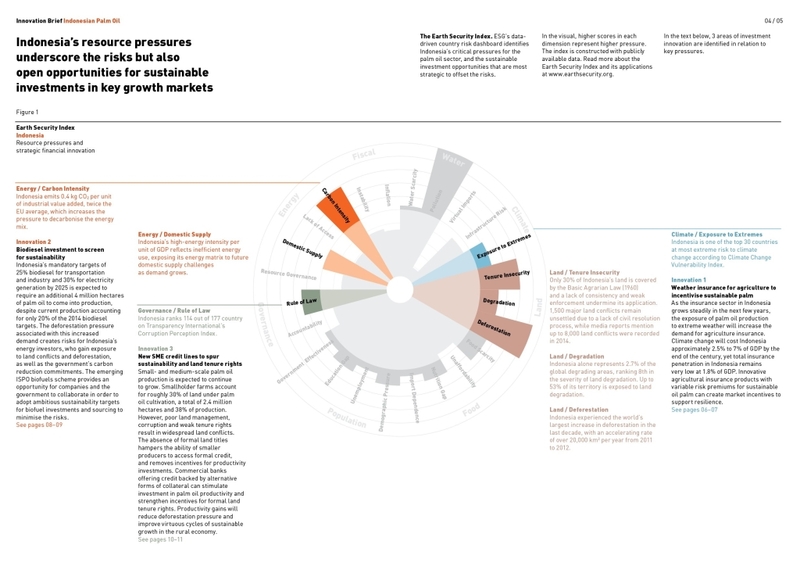 The Earth Security Index Indonesia was used to identify resources pressures and areas of market growth and innovation for the palm oil sector. Copyright: Earth Security Group. You can download the report and contact Margot Hill Clarvis for more information. This project was supported by the UK Prosperity Fund South East Asia.